Rennsport Reunion V represented the unparalleled passion of Porsche enthusiasts. It drew nearly 60,000 people from across the globe to a single destination, all to celebrate one of the most accomplished, most magnetic, and most visceral sports car brands on earth – Porsche. The unparalleled weekend was headlined by the sights and sounds on, and off the track. 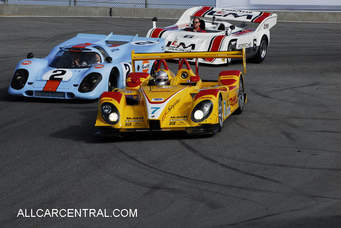 Roughly 320 Porsche racecars, in seven racing classes, took to the famed Mazda Raceway Laguna Seca circuit at racing speed. An additional 75 Porsche racecars, all with significant 24 Hours of Le Mans history wowed the spectators, while over 1,400 streetcars overflowed the available corral spaces. All weekend, fans rubbed shoulders with a well-decorated lineup of Porsche drivers, from current, to past. Current Porsche Factory Drivers: Patrick Long, Jörg Bergmeister, Mark Webber, and this year’s 24 Hours of Le Mans winning pair of Earl Bamber and Nick Tandy took in the festivities while Porsche racing icons, Jacky Ickx, Hurley Haywood, Vic Elford, Derek Bell, and others were on-hand to celebrate the most recent Le Mans victory, the record 17th overall. Racer, Rally and Pikes Peak champion, and award-winning director, Jeff Zwart captured the entire Rennsport weekend through his unique perspective as a driver, Porsche owner, and historian. The collection of Jeff’s films, 4 in total, include an immersive look at Rennsport, the Legend of Le Mans, the unique perspective of a driver, and a Rolling Timeline of the Porsche legacy. Although the event dates have passed, the effects of Rennsport Reunion V are everlasting. Explore the passion at the heart and soul of Porsche Motorsports and Rennsport with three artfully captured, period specific galleries by photographers Jesse Alexander, Bill Warner and Camden Thrasher. Each photographer was given the assignment of capturing two decades worth of images over the course of one weekend. Jesse focused on the 1950’s and 1960’s, Bill covered the 70’s and 80’s and Camden highlighted the 1990’s through today with each lending their own distinctive style to chronicle what makes Rennsport unlike any other gathering in the world.